I love drinking wine from New Zealand. 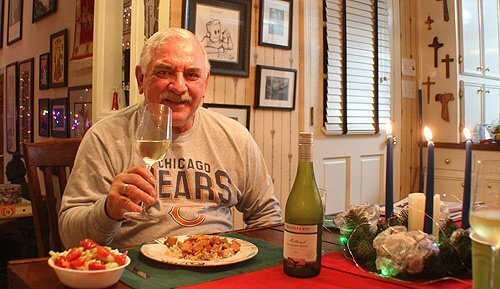 I have always loved the fresh, over-the-top, in-your-face robust flavors of their wines. That approach with its crisp grapefruit flavors put New Zealand sauvignon blanc on the world wine map in the 1970s and ‘80s. But my wife Teri is like many people who don’t care for that approach. They appreciate more subtle flavors and smoother wines. I suspect Waipapa Bay is reaching out to those wine drinkers with their new line of wines. I liked all four of their varietals, but the two that really stood out for me are the rosé and the chardonnay. They also make a sauvignon blanc and pinot gris, both of which are excellent wines. This joint venture between Rossendale Winery and Broadland Wineries is part of a broader evolution of winemaking throughout New Zealand. There are still plenty of winemakers going with the grapefruit-rich wines that made New Zealand famous, but Waipapa Bay and others are aiming for wines with elegance and a sense of place. The rosé is 100 percent pinot noir, giving it plenty of red fruit flavors, especially raspberries and strawberries. It has elegant aromas of summer fruit with some hints of rose petals and spice. The grapes from the Canterbury region are soaked for 24 hours. All that skin contact gives the wine a beautiful pale salmon color. This medium-bodied wine is as good in winter with heavier food as it is in summer, when it would be a great refresher. It is best when served slightly chilled. 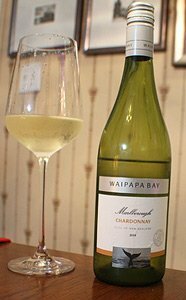 The 100 percent chardonnay from Marlborough has aromas and flavors of grapefruit, but they are more muted than in a typical New Zealand sauvignon blanc. The region is especially well known for its sauvignon blancs, but Marlborough chardonnay also is beginning to attract a lot of attention. This chardonnay has layers of grapefruit and lime flavors with subtle vanilla notes. It is soft and elegant with a nice creamy mouthfeel. All four of the wines come in screwcap bottles, making them perfect for taking on picnics or outings on the lake. The highly aromatic and in-your-face style that brought prominence to New Zealand wines continues to be popular, but as consumers focus more on food-friendly wines they are discovering the more balanced style of wines that New Zeaand can produce. The name Waipapa Bay comes from the laid-back surf spot on the Pacific Ocean, a place of stunning, natural beauty. It is located halfway between the Canterbury home of Brent and Shirley Rawstron and their vineyards in Rapaura. Traveling from winery to vineyards the Rawstrons often stop at this coastal town to see the seals or whales, which are regularly spotted off the coast. For now the wines are available only at Publix. They soon should be more widely available. 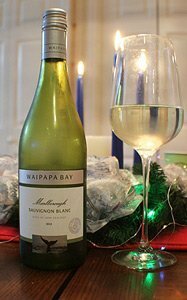 Winery: Waipapa Bay is a joint venture of Rossendale Winery and Broadland Wineries. Family owned and operated by the Rawstron family, Rossdendale has vineyards in Marlborough and Canterbury. The nearby Pacific Ocean provides ideal climatic conditions for the vines to thrive and gives a signature fresh character to all the Waipapa wines. 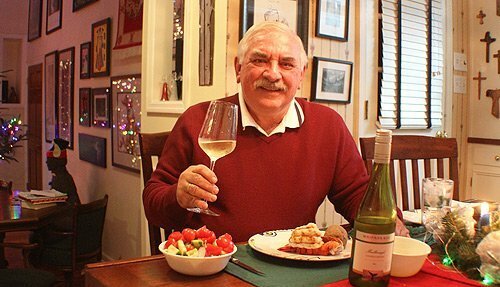 Brent and Shirley Rawstron started out in 1987 with 7.5 acres of chardonnay and pinot noir on the banks of the Halswell River in Canterbury, New Zealand. They soon realized that Canterbury was not ideal for growing chardonnay and replanted to pinot noir and a small amount of gewürztraminer. Today, they have 15 acres planted on north-facing slopes. Fueled by their interest to grow different white grape varieties, in 2004 the Rawstrons ventured into Marlborough for more vineyards sites. The Rapaura area of the Wairau Valley – a sub-region known for the individual qualities produced by different vineyard sites – immediately caught their attention. The couple now own 100 acres of vineyards planted to sauvignon blanc, chardonnay, and pinot gris. To produce the Waipapa wines the Rawstrons work with Master of Wine Dr. Arabella Woodrow of Broadland Wineries. Broadland is an international wine business with British heritage. It brings innovative and modern wines to consumers. Throughout its 50-year history, the mission remains the same: to offer superior service, quality, and value at all times. Woodrow brings extensive knowledge and nearly 40 years experience working in the industry to the project. She earned her undergraduate degree and Ph.D. in Biochemistry from Oxford University and, after joining the wine trade, went on to pass the WSET Higher Certificate and Diploma examinations and then the rigorous Masters of Wine exam in 1986. Since then she has worked in many areas of the wine trade. She’s an expert in the mesoclimates of Marlborough and finds that it’s very easy to make a more restrained, nuanced wine from grapes grown there. 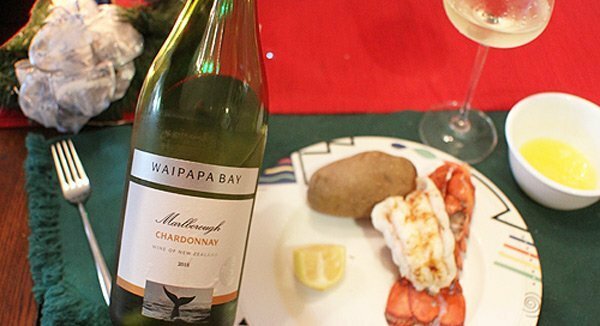 Waipapa Bay Chardonnay was outstanding with a broiled lobster tail. Goes with: These wines are designed to pair with food; they harmonize with the meal instead of competing with it. The rosé is a versatile wine. It will match well with white meat, grilled fish dishes and many cheeses. We had it with one of those spiral cut hams that are loaded with sweet flavors, and creamy mashed potatoes. The wine was perfect for the meal, with the richness of the wine complementing the ham flavors. It also would work well with ham sandwiches or fried chicken on a picnic. Sprinkle the meat with lemon juice and paprika and broil the lobster for about five minutes or until the meat turns bright white. I always serve lobster tails with small bowls of melted butter for dipping. It is one of our favorite “fancy” meals, and when you buy the lobster tails on sale for $5 or $6 apiece, it’s an economical meal. If you watch the grocery store ads, you can find a deal on lobster tails almost any week. The chardonnay also is perfect with poultry, veal, cheese-based pasta dishes and cheese boards. It should be served chilled. The sauvignon blanc was a nice pairing with Kung Pao Chicken.